Australia Best way to get CNC Table (Plasma) on a budget ? Thread: Best way to get CNC Table (Plasma) on a budget ? Best way to get CNC Table (Plasma) on a budget ? I have a very limited budget, but already own a plasma cutter, so was hoping I might be able to put something together like this. Or is there a better way to do things ? Maybe buy a cheap Chinese table and upgrade the motors etc ? Anyway guys, I would really appreciate any advice / input you may have! Re: Best way to get CNC Table (Plasma) on a budget ? Thanks very much for the offer! Ill send you a PM about a visit! Don't know what your budget or size requirements are but a Chinese "kit" may work for you. Like many Chinese machines, they are often quite good fully assembled "kits" but need some finishing to make them better. If you go this path be absolutely certain they understand what you are asking for. I might be able to help if you would like to describe what you are looking for in detail. Send me a PM or e-mail if you don't want to post here. Building the table is not that big of deal I have done a few, what kills it here is the price of a good size Hypertherm plasma. That will cost you as much if not more than the table. Yer and like i said in the other post " your point is???" 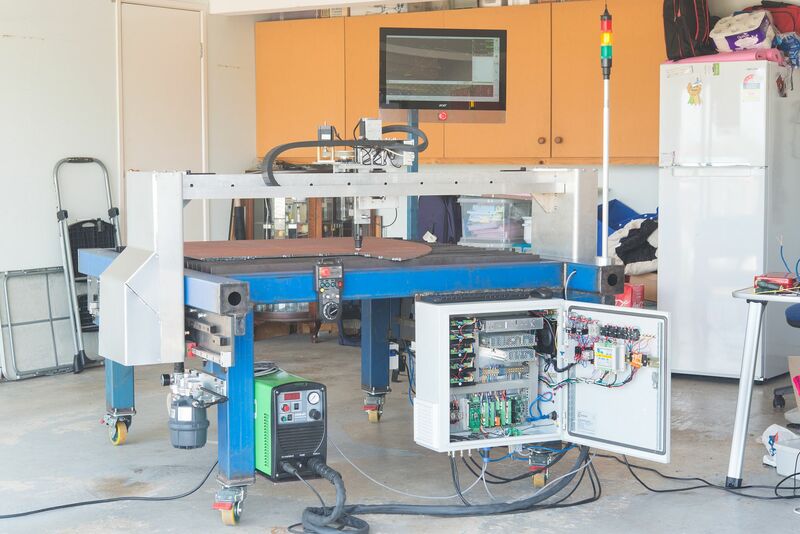 Someone wanting to build/buy a CNC machine and someone wanting to sell one or is that cross-reference too obscure since both folks are in Australia and their posts are but a few days apart? This thread is talking about plasma. The other is a Router. Design parameters are poles apart. Plasma gantry needs to be light and quick with no cutting forces to worry about but acceleration is king!. I am planning my cnc as well and was hoping to come and look at yours and maybe get a bit of advice if possible. Oops, sorry I thought I'd changed that address when we moved out of home into a warehouse at Acacia Ridge but it was hardcoded. But my phone numbers are on that page. Try again now its edited. I've now got a Thermal Dynamics 120 amp cutter on it so 16mm is a walk in the park!